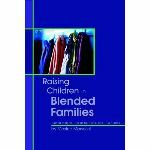 The following is a report on the practical applications of Maxine Marsolini's new book, Raising Children in Blended Families, (Kregel Publications, 2006). Although blended families are now nearly as common as traditional families, they’re much more complicated. Parents and children trying to build a new family on the ruins of a previous one can become overwhelmed with emotions and find it hard to resolve problems. Make peace with your past. Pray often for God to give you and all your other family members peace. Seek healing from God for your past suffering and His forgiveness for your past mistakes. Deal with your grief and encourage your children to fully express their own grief, with the help of a professional counselor if necessary. Let go of whatever you can’t change and begin to concentrate on what you can do to align yourself with God’s plan for your family. Keep the future in mind. Remember that your words and actions today impact your family’s future. Before making decisions, ask yourself how what you do today will likely affect your children in several months, a year, or many years from now. Rather than simply reacting to life as your emotions lead you, decide to live intentionally, with good purposes in mind. Be patient. Understand that it will likely take several years to develop solid relationships within your blended family. Give yourselves plenty of time to get to know each other and build your new family’s history together. Don’t force close relationships right away; bear with each other so you can gradually build close bonds. Be sensitive to when the time is right for each family member to move forward in relationships. Listen well. Value the thoughts and feelings of each family member – even the youngest children. Make time regularly to genuinely listen to what they’re saying, validate what you hear, and act on their ideas in constructive ways. Let everyone in your family know that they have a real voice in your life together. Lighten up. Don’t let the serious issues you’re dealing with steal your joy in everyday living. Accept your life, pray for peace about it, and decide to move into the future with a positive attitude fueled by hope in God’s good plans for you. Have fun and laugh together as often as possible. Stop being your ex-spouse’s enemy and start being an ally. Never make your children choose between loving their mom and loving their dad. Know that it’s healthy for them to love both of you. Give them time to spend with each of you. Don’t speak negatively about your ex-spouse or fight with him or her in front of your children. Ask God to help you maintain an amicable relationship for the sake of your children’s emotional health. Be a smart stepparent. Realize that a lot of your blended family’s bonding depends on the way you integrate into the family. Know that your role matters so much that you can make or break the family. Choose to be sensitive to others’ needs. Demonstrate acceptance and be quick to forgive. Support the birth parent’s parenting style and let him or her (not you) be the primary disciplinarian. Let go of selfish habits, jealousy over another parent or child, and control games. Manage your anger in healthy ways. Don’t try to replace the parent your stepchildren have lost. Move into the family gently and slowly. Try not to favor your own children over your stepchildren. Spend one-on-one time with each child, perhaps by helping with a homework project or going on a fun outing together. Start to build a future together in positive ways, such as by adopting a new family pet. Nurture your marriage by making regular dates a priority. Plan fun times the whole family can enjoy together. Be willing to get help from a professional counselor if your family’s problems are too stressful to handle yourselves. Get a support system in place. Surround yourself with close relationships with people you can trust to encourage you. Join a church and build meaningful friendships there. Reach out to extended family members. Regularly share what’s happening in your family life and ask for prayer. Ask another family you admire to consider mentoring yours. Keep your promises. Understand that promises mean a lot to children, and children who have gone through the trauma of seeing their past families break up especially need the security of knowing that you won’t break promises. Do your very best to honor your commitments to them, so they’ll learn that they can trust you. Make time with your children and stepchildren a priority. Know that, more than anything you else you can give them, children crave time with you. Don’t let work or other pursuits crowd out time you should be spending with your children and stepchildren. Do all you can to make sure that you’re spending significant amounts of time with each of them. Establish a supportive environment at home. Try to make your children and stepchildren feel comfortable at home with your new living arrangements. Let them talk freely without interrupting or contradicting them. Encourage them to ask whatever questions they’d like, and gladly do your best to answer them. Affirm them as often as you can. Say "I love you" regularly, and demonstrate it through hugs and other affectionate actions. Try some new activities or outings together just for fun. Make sure that each of your children and stepchildren know that you truly enjoy being with them. Guard against abuse. Recognize the sobering fact that instances of verbal, physical, and sexual abuse are much higher in blended families than in traditional ones. Be aware of what’s going on in your family. Know that if you suspect something is wrong, it probably is. Assure your children and stepchildren that you will always listen to their concerns. If you sense a child or stepchild acting fearful of something, have honest one-on-one talks with that child to get to the bottom of the situation. If a child or stepchild comes to you with concerns about abuse, take him or her seriously and act immediately to protect that child. Emphasize modesty in your home. Until a stepparent or stepsibling has proven to be a protective person in your children’s lives, assume that the stepparent or stepsibling is no more trustworthy than a stranger. Repair damaged relationships. Humble yourself and admit to your children and stepchildren that you’re not perfect. Ask them to forgive you for mistakes you’ve made that have hurt them. Expect that, in time, you may earn their trust once more as they see you live out your faith and make healthier decisions in your relationships with them. But don’t force reconciliation. Realize that you can’t make someone else – whether a parent or a child – reconcile a relationship, no matter how badly you may want that to happen. Just become a cheerleader in their lives, giving them encouragement and helping them to believe in themselves because they know that you believe in them. Change old, unhealthy patterns into new, healthy ones. Ask God to help you recognize unhealthy patterns of relating that need to be changed for your family to be truly healthy. Pray specifically about each one and rely on God’s strength to deliberately make better decisions about relating from now on. Deal well with flashbacks. If you’re tormented by bad memories of the past, pray about them, write about them in a journal, talk them through with a trusted friend, or seek a professional counselor’s help to stop them from interfering with your life now. Honor past traditions as you build new ones. Share your old family’s stories with your new one. Learn about the heritage of each person in your blended family. Keep some traditions from the past that still work well in your current lives, and add some new ones to the mix. Accept your children and stepchildren unconditionally. Give them the freedom to be themselves and share their thoughts and feelings honestly, without fear of condemnation. Let them know that there are no conditions to your love for them. Release any unrealistic expectations of them. Help them discover their unique interests, talents, and learning styles. Cheer them on as they develop their skills. Do all you can to help them build confidence and set goals. Stop criticizing and start offering praise as often as possible. Regularly express how grateful you are for each of your children and stepchildren. Keep communication lines open. Schedule family meetings often – once a week, if possible. Use these times together to listen carefully to everyone’s concerns about your family life together, and figure out how to best address them. Adapted from Raising Children in Blended Families, copyright 2006 by Maxine Marsolini. Published by Kregel Publications, Grand Rapids, Mich., www.kregel.com. Maxine Marsolini is an author, speaker, pastor's wife, and member of the American Association of Christian Counselors. Together with her husband, Charlie, they are a blended family with seven children, which makes her a valued resource for stepfamilies. Maxine's articles have appeared in magazines such as Decision, Lifewise, Bible Advocate, and Whispers from Heaven.